In 1958, Jay DeFeo began work on The Rose. It is a monumental work of art that explodes from its center, evoking a feeling of deep time within a palpable present. Said to embody the entire history of art, beginning with the first bang of inspiration, the painting was originally called the The Death Rose, then The White Rose, and finally The Rose. While many of DeFeo’s works are part of a series, a triptych, or a pair, The Rose stands alone, embodying successive forms and evolving visions. The central locus of The Rose served not only to anchor the painting itself but also the activity around it. In artwork by fellow artists in San Francisco at the time—Bruce Conner, Wallace Berman, and DeFeo’s husband, Wally Hedrick—The Rose appears as a constant backdrop to the events that unfolded in DeFeo and Hedrick’s apartment and the nearby gallery they ran called Six Gallery. In photos taken by friends, The Rose even acts as a second presence, another figure in the room with its own depth and emotion. The painting itself is three dimensional and massive. The final version measures in at 128 7/8 x 92 1/4 x 11 inches and weighs close to a ton. It was built up over eight years through the continual application, removal, and reapplication of layers and layers of paint, until not only the canvas was completely covered, but areas of the walls and floors of the apartment as well. A small yellow piece of company stationary, from the local paint shop from which DeFeo bought her industrial grade paint, estimated that DeFeo purchased over five thousand dollars worth of white paint alone.2 It was the lead in that white paint that is sometimes blamed for the physical and psychological problems that afflicted DeFeo after she stopped working on The Rose. Three trends define DeFeo’s art practice: it is personal; it shows the struggle of its creation; and it is fractured. All of these are present in the The Rose. But unlike some of her other works, The Rose grounds itself in its strong center. Like a photosensitive canvas for feelings, the painting captures the sentiment and history of DeFeo and the world around her, her own personal narrative becoming tangled up in the long history of the painting itself. The final iteration of The Rose is almost bulbous, as if the canvas is overburdened and needs to expunge some great desire or expression beyond the constraints of its surface, to push the envelope so to speak. In his essay, “Jay DeFeo: The Transcendental Rose,” Robert Berg suggests that we can see The Rose as a giant womb, pregnant with life and creation, a being about to be born. Despite its emotionally laden form, its representation was borne out of an almost technical act of creation: emotions and passions were applied, with the paint, to each successive layer simply through the passage of time connected to a daily practice of working on the canvas. Scholarship on DeFeo’s work occasionally focuses on her status as a woman during the Beat Era or the religious undertones of her work. More common however, are the discussions that highlight her personal struggles after the completion of The Rose, as she endeavored to find a museum to purchase the painting after its removal from her Fillmore Street apartment in San Francisco. Had DeFeo been able to finish The Rose in time for the 1959/60 MOMA show, Sixteen Americans, her career might have taken off and her story might have been quite different. DeFeo could have nurtured a career in New York, traveling to museum openings and making new works of art, but that would have taken her away from her work on The Rose, which she wanted to finish before starting anything new. Viewing The Rose next to photos of its earlier iterations, the final version seems to lack some of the vigor and vibrancy that permeated earlier incarnations. Rather than pregnant, it looks bloated, sagging in the middle. Rather than taking its final form as a completed piece, the moment in which the piece was finally finished, we can instead understand it as simply a place to stop, the last pass of many successive passes. When Hedrick and DeFeo were evicted from their apartment, the space to continue working on The Rose was simply no longer available, and the conditions that allowed for DeFeo’s eight years of focused practice on a single painting disappeared along with it. Place, and more specifically, the centering of her art practice in long hours of work and the space of her apartment, was crucial to the creation of The Rose. Installed in the bay window of DeFeo’s Fillmore flat, the canvas was expanded early on, after which it filled the entire area of the bay window. The side lighting created by the placement of the canvas proved essential to how the painting developed and was appreciated. Museums that exhibit the piece today sometimes attempt to recreate the effects of that side lighting within the gallery. In order to remove The Rose from the Fillmore apartment, a section underneath the bay window had to be removed as well. In a short film Bruce Conner made of the day The Rose was removed, “The White Rose” (1967), one of the final images is of DeFeo sitting in the hole left by the removal of the giant canvas. Next to her is one of the old and dead Christmas trees that DeFeo collected, marking (or filling) the void left by the sudden removal of the painting. Following DeFeo’s eviction, it was years before a new home was found for The Rose. It travelled first to Southern California, and then back to San Francisco, before making its way to New York. It was stored in obscure gallery spaces and even behind a false-wall in a conference room of the San Francisco Art Institute. Only years later did the Whitney Museum finally conserve and then acquire the painting. There is something poignant about The Rose’s need for a home. In the numerous letters Jay DeFeo wrote to curators and art critics in the hope of finding a place for her masterpiece, the desperation is almost palpable.3 Where The Rose had first been a site for inspiration and artistic practice, it later became a burden. Unable to continue working on it, DeFeo was determined to find a place for it, perhaps as a means for letting it go. DeFeo’s letters also express a feeling of dislocation in her own life as she struggled to ground her practice after years of focused attention on a single painting. In a series of letters DeFeo wrote to Bruce Conner, the well known artist and DeFeo’ close friend and colleague, she explains how her later works were hampered by the confined spaces of her living situation; walls got in the way of the big canvas she wanted to make. Tracing some of the trajectories of DeFeo’s work through representations by the artists who knew her reveals the centrality of place in DeFeo’s work, and perhaps nowhere as much as with The Rose. This offers a kind of counter narrative to the constant roving that is so endemic of the Beat generation’s search for truth. Rather than looking here and there, DeFeo simply dove right into the intense labor of the right here, right now. It was a process highly dependent on place and a routine made possible only by returning to the same spot and the same canvas day after day. The proximity of other artists in the area around her Fillmore apartment meant that DeFeo could, even from her spot in front of her painting, engage in a vibrant community of art practitioners. Not far from their apartment, DeFeo’s husband, Wally Hedrick, ran the famous Six Gallery. It was in the Six Gallery that Ginsberg first publicly read his poem “Howl.” DeFeo invited her friends and colleagues into her studio, and they, in turn, drew inspiration from her work and creativity. The results of these exchanges now make up part of the oeuvres of Wallace Berman, Bruce Conner, and Wally Hedrick, all of whom have works that feature DeFeo and The Rose, often in relationship to one another. 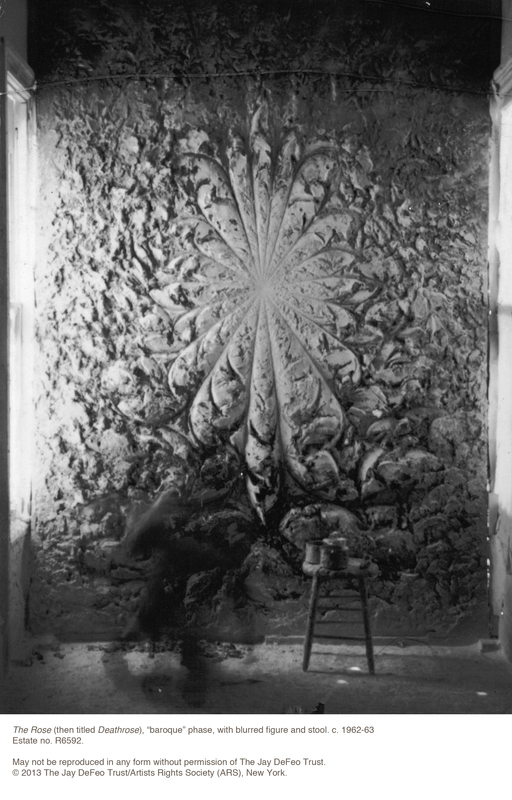 In a set of photos by Wallace Berman, DeFeo is shown in front of an early stage of The Rose. The underlying cruciform of the painting is much more apparent than in later versions, mirrored in Berman’s photo by DeFeo’s own outstretched body. Because the light is not centered on DeFeo’s heart but at her head, The Rose also reads as a halo, an expansion from her mind, rather than her heart. Rather than fusing DeFeo and The Rose, Berman’s photo puts them into relation with one another, at times mirroring, at times embracing, depending on whether DeFeo is facing toward or away from The Rose. There is another famous and poignant image of DeFeo and The Rose, this time captured by Bruce Conner in his film, “The White Rose,” mentioned above. The painting and the section below the bay window have just been removed and the canvas laid on the ground. Once the canvas had been covered with material to protect it for transport, DeFeo laid on top of it. The shot feels like a private moment just before the painting is taken away and suggests another reading of The Rose: a kind of death image. In a eulogy written for DeFeo in 1994, Bruce Conner wrote: “[The Rose] was a masterpiece of spirit and transformation that almost destroyed [DeFeo] through lead poisoning and its dominance over her relationship to the conscious world.” The destructive process of DeFeo’s work is also what gives The Rose its vitality. The process of revisiting the same objects again and again, in new media, with new light, of tearing things apart and then putting them back together again, suggests a kind of seeing and bringing things into being that is dynamic, destructive, and regenerative. DeFeo is quoted as saying that you cannot understand her work except in its totality.4 In other words, it is not in any one image that we can find the artistic center of DeFeo’s oeuvre; rather it is in the space between them, within the place of her practice. To give expression to the intangible space that unites DeFeo’s work, during the showing of the Whitney Museum’s retrospective of Jay DeFeo at San Francisco Museum of Modern Art (2012), a famous drawing DeFeo made of her own eyes was placed across the gallery space from The Rose. The tension between the two pieces in the exhibit hall was palpable. The eyes are huge, and were made before she began work on The Rose. Visitors to the gallery were thus caught between the processes of seeing and making; the eyes of one canvas big enough to envisage the magnificence of the other. DeFeo’s work is precisely in the ether of the creative process, in the space between projects. The Rose, today, is just a frozen moment of a much longer practice of artistic creation. It is a final declaration of the importance of place at the heart of Jay DeFeo’s art practice, of the long hours painting, sitting, entering, and feeling center. 1. Quote taken the Oral History Interview of Jay DeFeo conducted by Paul Karlstrom; Session 3: January 23, 1976. Smithsonian Institute. Copied here from The Jay DeFeo Trust website: http://www.jaydefeo.org/therose.html#img/therose1_full.jpg. 2. Bancroft Library holdings: Bruce Connor collection. 3. These letters can be found in the Bancroft Library, UC Berkeley, within the holdings of Bruce Connors correspondences concerning Jay DeFeo’s “The Rose,” circa 1930-1996. 4. Jay DeFeo: A Retrospective. Whitney Museum exhibition on show at the San Francisco Museum of Modern Art (SF MOMA), 2012. 5. 1994 essay on DeFeo [Became the text for the Kohn Turner Gallery Announcement of a show for Jay DeFeo “Drawings and Photo Collages from the 1970s.” The outside image being of the tripod]. Berg, Robert. 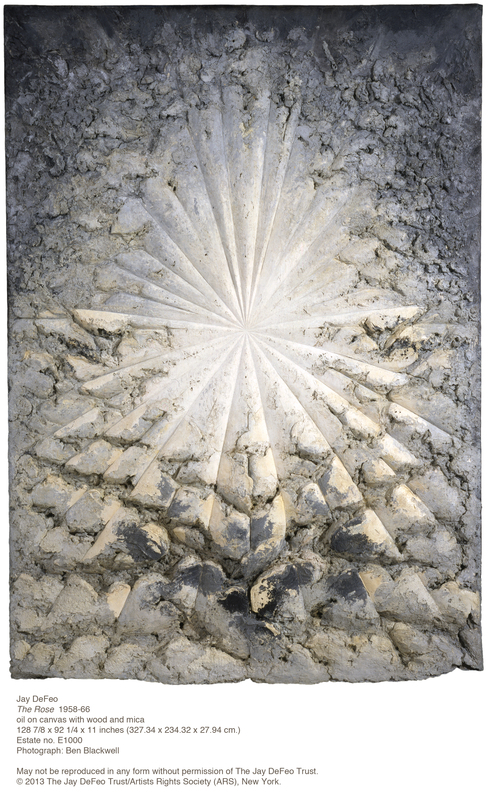 “Jay DeFeo: The Transcendental Rose.” American Art 12, no. 3 (October 1, 1998): 68–77. Burroughs, William S. The Third Mind. New York: Viking Press, 1978. Burroughs, William S. “Excerpt: Naked Lunch.” Chicago Review 42, no. 3/4 (January 1, 1996): 42–48. CA Palm (Firm), and University of California (System). The Beach Videorecording. University of California Extension Center for Media and Independent Learning, 1995. Cohen, Katherine Powell. San Francisco’s Haight Ashbury. Images of America. Charleston, SC: Arcadia Pub, 2008. ———. “The white rose.” s.n, 1965. Davis, Joseph K. Man in crisis; perspectives on the individual and his world. [Glenview, Ill.: Scott, Foresman, 1970. DeKoven, Marianne. Utopia Limited: The Sixties and the Emergence of the Postmodern. Post-contemporary Interventions. Durham: Duke University Press, 2004. Ford, Phil. “Hip Sensibility in an Age of Mass Counterculture.” Jazz Perspectives 2, no. 2 (2008): 121–163. doi:10.1080/17494060802373382. Johnstone, Mark, and Leslie Aboud Holzman. Epicenter: San Francisco Bay area art now. San Francisco: Chronicle Books, 2002. O&, William L., William L. O’Neill, amp, ‘, and Neill. Dawning of the Counter-Culture: The 1960s. Now and Then Reader LLC, 2011. Phillips, Lisa, Whitney Museum of American Art, Walker Art Center, and M.H. de Young Memorial Museum. Beat Culture and the New America, 1950-1965. New York ; Paris: Whitney Museum of American Art in association with Flammarion, 1995. Roszak, Theodore. The Making of a Counter Culture; Reflections on the Technocratic Society and Its Youthful Opposition. Garden City, N.Y: Doubleday, 1969. Watts, Alan W. “Beat Zen, Square Zen, and Zen.” Chicago Review 12, no. 2 (July 1, 1958): 3–11. Williams, R. John. “Techne-Zen and the Spiritual Quality of Global Capitalism.” Critical Inquiry 38, no. 1 (2011). Zschocke, Nina. “28 The Strategy of Visual Irritation: Forms of Ambiguous Representation in Contemporary Art.” In Studies in Multidisciplinarity, edited by Grant Malcolm, Volume 2:373–388. Elsevier, 2005. http://www.sciencedirect.com/science/article/pii/S157108310480056X. Green, Jay; Leavy, Lay (editors). Jay Defeo and the Rose. Berkeley: University of California Press, 2003. Reading California: Art, Image, and Identity, 1900-2000. Los Angeles: Berkeley: Los Angeles County Museum of Art ; University of California Press, 2000. “The Jay DeFeo Trust.” Accessed November 26, 2012. http://www.jaydefeo.org/.